The Symphony developed from the Orchestral Suite, which in turn, developed from the Dance Suite - collections of shorter dance pieces. J. S. Bach wrote four Orchestral Suites between 1717 and 1723, while he was conductor of the court orchestra in Cöthen - including his Suite No. 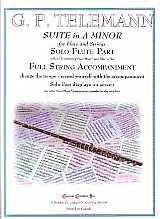 2 in B Minor for flute and strings. Like Telemann, Bach’s Suites use Continuo (Harpsichord and Cello) and are made up of six or seven “movements” (using the terminology of the symphony), opening with an “Overture” (the actual name by which Bach referred to his Suites) written in the French style: slow introduction (using dotted rhythms) followed by a faster, more lively (and contrapuntal) main section, concluding with a slow section, alluding to the opening. The Overture, which is, by far, the longest movement, is then followed by shorter “dance” movements (i.e., movements using the structure and style of various dances - Minuet, etc.). Unlike Bach’s Suite in B Minor, which is a Suite, which happens to employ the Flute, and occasionally feature it, Telemann’s Suite in A Minor uses the Flute as a Solo Instrument, only employing it in the tutti sections in the Overture. All of the movements of Telemann’s Suite in A Minor have French titles, including, surprisingly enough, Air a L’Italien (an Air in an Italian style). Little of the history of this work is known; it was not published until 1936 - based on an 18th Century manuscript which had no forward, title page or date, at the Hessian State and High School Library in Darmstadt.